A BBC micro:bit with a Kitronik Inventors Kit for the BBC micro:bit, a 1M anti tangle USB Cable, a Battery Cage and 2 x AAA Batteries. Your BBC micro:bit will come in one of 4 colour schemes, unfortunately it is not possible to specify which colour you will receive. On its own, the Kitronik Inventors Kit offers a great introduction to the world of physical computing. Its 12 experiments showcase how code and electronics can combine to create real world every day practical solutions to situations and problems. Harnessing the power of the elements, using sensory input to make things happen, and using variable input amounts to effect a gradual change are just some of things you can learn as you progress through the experiments. But why stop there? In our homes, schools and offices we are surrounded by consumer electronics that at their core, are physical computing devices. Coded electronic devices are everywhere. Many of these devices have been coded to communicate things to us, both visually and audibly. The two add-on packs for the inventors kit have been specifically devised to introduce you to these aspects of practical physical computing. ZIP LEDs Add-On Pack for Kitronik Inventors Kit for micro:bit - Most consumer electronics heavily rely on LEDs, as LEDs are a great way of providing instant visual feedback for the user. With this add-on pack you will learn how to write code to take control of ZIP LEDs and also learn how to make ZIP LEDs respond to input from components such as potentiometers and sensors. Noise Pack for Kitronik Inventor's Kit for the BBC micro:bit - Learn how to manipulate sound, build instruments, amplify your sounds, and how to shape your sounds with Filtering and EQ. Note: The Inventors Kit for the BBC micro:bit requires assembly. 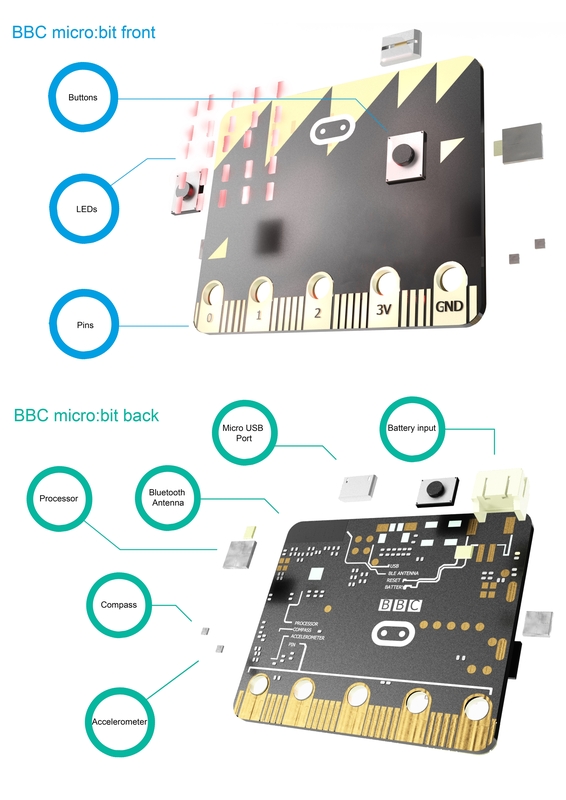 Breaks out 21 accessible pins from the BBC micro:bit using the Edge Connector Board for the BBC micro:bit. 1 x Kitronik Inventors Kit for the BBC micro:bit. 1 x Miniature LDR. For booklet Versions pre V1.7. 1 x Phototransistor. For booklet versions post V1.7. 1 x Terminal Block Screwdriver. 2 Pre V1.7 Using an LDR and analog inputs. Full Experiment + Further Help. 2 V1.7 Using a Light Sensor &analog inputs. Full Experiment + Further Help. Further Help. 11 Making a pedestrian crossing. Full Experiment + Further Help. 12 Making a random dice. Full Experiment + Further Help. This kit walks you through the basics of using the Arduino in a hands-on way. You'll learn through building several creative projects. O Kit Iniciação Arduino uno para aqueles que estão interessados em aprender sobre Arduino. Kit Avançado para Arduino Uno é dedicado para aqueles que estão interessados em aprender sobre Arduino. A BOXELECTRÓNICA apresenta o Kit Avançado para Arduino Mega para aqueles que estão interessados em aprender sobreArduino. We have upgraded the Beginner Kit for Arduino! Now the latest v3.0 kit comes with more useful components, more handy projects and higher quality parts. And most importantly, still the same price.